They say that a house is made of bricks and beams, while a home is made of love and dreams. A person’s dreams are usually endless, however there are some common dreams that almost all of us live with; and these dreams include a well decorated home in the priority list. Whether it is an apartment, a villa or a mansion, it needs to have all the accessories that could make life more enjoyable and pleasant. If you are also one of many people out there who want to make their home feel welcoming and lived-in and to transform it into the one that feels like it was designed just for them. Below are four tips from AmerAdnan® that’ll help you transform your house into a home of your dreams. Lighting undoubtedly plays primary role in the overall look and feel of any space. If your home has lights that directly hit your eyes, you’ll never feel comfortable and good about it. This is why spotlights were invented; they avoid direct exposure of light to the eyes and provide smooth light that is reflected through the wall or roof of the room. This creates an intimate atmosphere and gives a truly welcoming feel to your home. 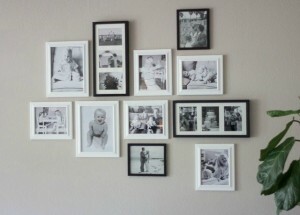 By hanging group and individual photos of all the family members from big to small on a wall, you can create a feeling of love and inspiration. The gallery wall of photos brings a character into your space which is why it needs to be created in high traffic area of your home, preferably in the corridor or in the living room. The gallery should ideally have white or plain colored frames of all photos hung in the checkerboard style or any other pattern. A cozy rug can always help you tying a room together. 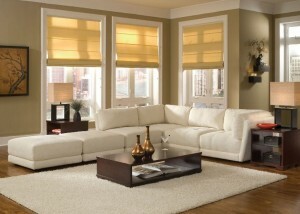 It helps to make any space feel extremely comfortable and relaxing. The cold and bare floors usually make rooms feel unfinished and sparse. There are many different types of plush rugs available in many different design patterns and colors to suit your home interior theme and your choice. Buying the rugs in colors that are complementary to a room’s furnishing is also a really good idea. Giving your home a touch of fantasy and class was never this easy. Thanks to the interior design experts for creating wall decals. These smart tools are designed in different shapes and designs to match different interests. There are wall decals of cartoon characters to please your kids. 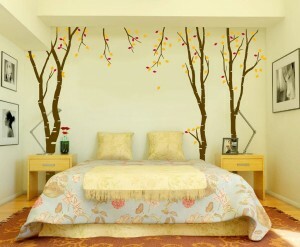 You can also find wall decals of trees, flowers, leaves & petals for all the nature lovers. These removable wall stickers made from vinyl stock are found in majority of the modern house designs in Lahore these days.